This week I'm posting one new game a day on the blog. All games were submitted by you! Today's game is a mixer called 'Banana Slap' and was sent in by Chad Borgestad. Thanks Chad! A bunch of bananas; you can usually get 3 peels per banana. If you have 60 kids at club, you need 25 bananas to be safe. You basically peel a bunch of bananas and hand out the strips of banana peels to everyone. Then you have them partner up and grab a hand of a partner. The object is to slap the person in the face with the banana peel before they slap you. The winner moves on and finds another person who one. It creates tons of laughter for the bizarre nature of the mixer that it is! Great for that Banana Theme Club, goes well with the Banana Song, Banana Costumes and at the end of the night, the 18 foot Banana Split in a gutter lined with tin foil!!! 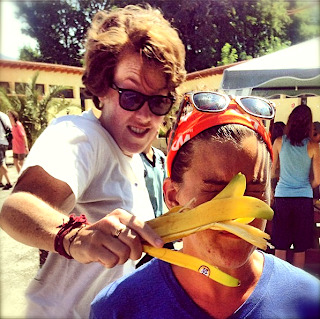 Recruit your committee members to come and make the Banana Split during your talk outside!